Hello friends! Welcome back to the Monday Montage Blog Hop! You may have gotten here from the amazing Bree Renwick’s blog, make sure you select the “next” button below and that will take you to the next stop on the hop, the wonderful Dani Dziama’s blog. I am sure we all have something special to share today! The page features two different leaf dies from the Botanical Builder Framelits Dies cut in Mossy Meadow and Pear Pizzazz. These leaves poke out behind the photos that are kinda scattered on the page. There is a piece of Crumb Cake cardstock that is the same size as the photos that has been embossed with the Woodgrain TIEF carrying the woodland theme. The sentiment is from Going Global and gold embossed on vellum, then die cut with the large heart from the Mini Treat Bag Thinlets. 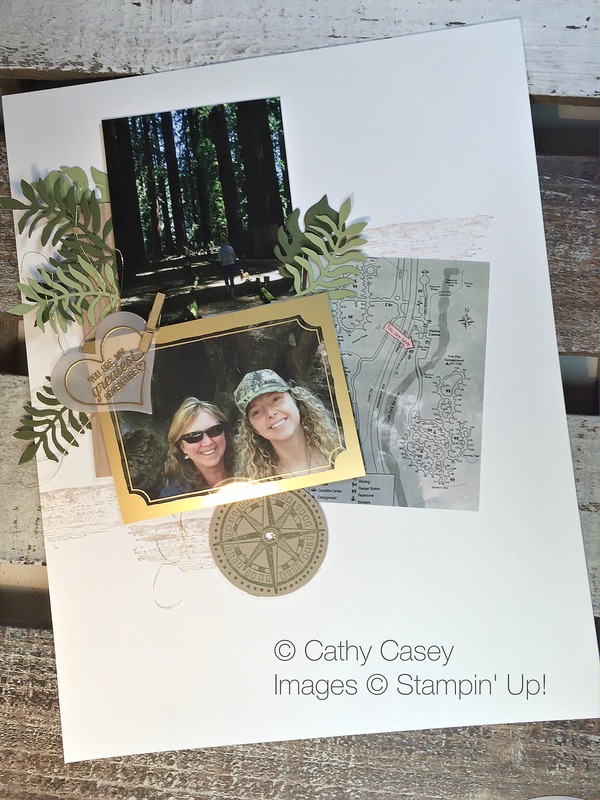 The compass from Going Global is stamped in Mossy Meadow on Crumb Cake and die cut with a circle die. 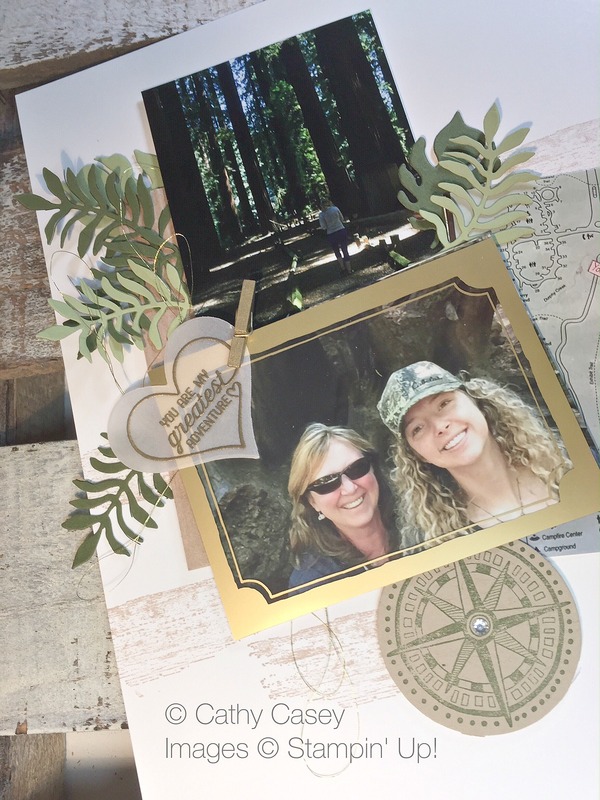 The gold frame around the pic is from the Memories in the Making Project Life Card Collection available for free during Sale-A-Bration! Don’t miss this cute set of cards, I am loving them right now 🙂 The last touches are some random grungy images from Timeless Textures in Crumb Cake, a tiny gold clothespin and some gold thread twisted in behind the trees and in the leaves. I hope you enjoy my little remembrance of last summer and the rest of our hop. Hopefully you are inspired to make something pretty today….and stay away from this flu if you possible can!!! This entry was posted in 2013 Artisan Design Team Finalist, Big Shot, Project Life, Sale-A-Bration, Scrapbooking, Stampin' Up, Thinlits Dies and tagged Botanical Builder, featured, Going Global Stamp Set, Montage Blog Hop, Scrapbooking, Stampin' Up, Timeless Textures Stamp Set by kate80132. Bookmark the permalink.